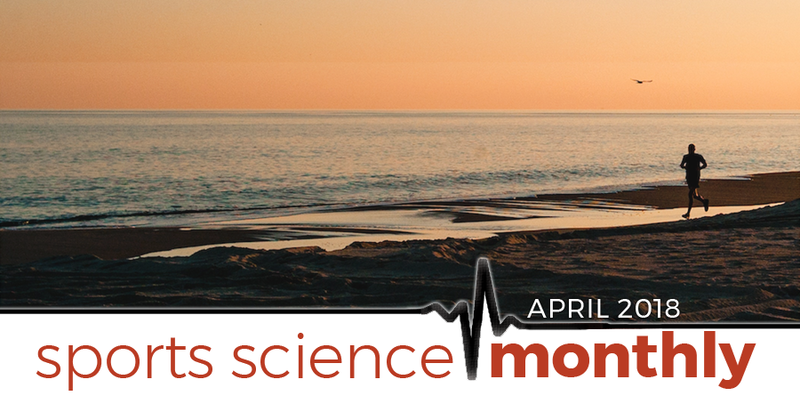 In the April edition of Sports Science Monthly we look at new research across a variety of areas including the best time of day to train, dietary supplements, asymmetries in sprinting, monitoring external and internal loads, workload injury relationship, and more. » Quick summary: Despite early research suggesting that peak strength and power performance occurs mid- to late-afternoon, the body’s circadian rhythms are trainable, and so perhaps the most important aspect is regular training at a specific time of day. It’s often been shown that, for strength training, an individual can produce their greatest muscle strength later on in the day, with an average performance decrement of between 5 and 10% occurring when strength training happens in the morning. However, many elite athletes still train in the morning, and, fortunately, it appears that regular training at this time eventually leads to the loss of this “neuromuscular deficit”; that is to say, if you regularly train in the morning, your body becomes accustomed to it, and you start to maximize your strength and power outputs at this time. The average time for this process to occur is around 5 weeks. Conversely, if you regularly train in the afternoon, this accentuates the morning neuromuscular deficit, such that if you’re ever called upon to produce maximum strength in the morning, there would be a greater difference between your AM and PM performance than at baseline. The causes of this AM/PM differential are likely largely circadian in nature, which is why this process can be altered, much like the changing of time zones with long distance travel. However, there is still much to be learned in this area, and further research is important to discover whether an AM versus PM regular training bout offers advantages in certain scenarios, or for certain fitness parameters. That’s where our first study comes in; it aims to explore the effects of training at different times of day in terms of the hypertrophic response to resistance training, with specific reference to what occurs at the molecular levels. The recruited subjects were all previously untrained, young (20-30 year old) males, who had a regular circadian pattern (i.e. went to bed and awoke at similar times each day, and had sleep lengths of regular durations). The subjects were randomly assigned to undertake training either in the morning (between 7.30-8.30am), evening (between 4-5pm), or not at all, for an 11 week period, separated by a pre- and post-testing period where muscle biopsy and blood samples were also taken. The training program was the same between subjects, and was progressive, moving from 10-15 reps at 40-60% 1RM to 8-12 reps at 50-80% 1RM. Both training groups increased their strength, and there was no significant differences between the AM and PM groups. There were also no significant differences in terms of changes in muscle size, with both groups showing similar increases in hypertrophy. There were differences in the molecular responses to the training bout between subjects; those in the PM saw a down regulation of signals within the p70S6K pathway, which is an important mediator of hypertrophy, whereas the AM group did not. A down regulation of signaling in this pathway is common in strength trained athletes, and so would be expected; the fact that it wasn’t in the AM group led the authors to suggest that perhaps this serves to offset some of the decrease in anabolic hormone release (or, more specifically, an increase in cortisol release) sometimes seen following AM compared to PM training – which is why both groups had similar hypertrophic and strength responses. In summary, it appears that there is no difference in strength training adaptations following an AM or PM only training programme. Whilst there may be differences in cellular signaling, these don’t seem to manifest in actual real-world differences; instead, they perhaps serve to offset other changes, so that the overall effect between the groups is similar. What this tells us is that the body can “learn” to train at a specific time, and so as a result it may well be better to train at a similar time each day. This could be extended to state that you should perhaps aim to train at a similar time as to when you’re expected to compete, but this could well get messy – in athletics, most regular competitions are in the evening, but national championships tend to be afternoon-based, and at major championships heats can often be in the morning – making accurate allowances for competition times can therefore prove difficult. It could also have an impact on the athletes day-to-day life; training in the morning is often far more realistic for high-level athletes, as it frees up the later part of the day for other activities that may otherwise negatively impact training. All in all, I think this tells us that it doesn’t really matter what time of the day you train, as the body will compensate, but that it’s probably a good idea to be consistent. Attempting to extrapolate this to competitions is perhaps, at this stage, a step too far, and may further complicate things.